ACCURATE, EASY TO UNDERSTAND and EASY TO MEMORIZE answers with no fluff. The Ultimate C# Question And Answer Quick Reference. Hundreds of questions and answers to cover every important topic. Also includes MVC, ASP.Net, ADO.Net, Entity Framework, WCF, Silverlight and OOP questions. Take it with you and be able to read it anywhere. Part of the bestselling Master Programmers Rockin Interview series. Negotiate your way into a 200% salary increase! Learn how you can work remotely from home for any company. See how its possible to go from $16 per hour to $250 per hour in less than a year. Make sure you get the best salary or rate when negotiating with a recruiter. I explain to you how salary and rate negotiation can add up to thousands more in income. I have over 20+ years of experience in the game and will give you all the shortcuts to getting the money you deserve. You will also get short, clear, concise and easy to memorize questions and answers to make sure you are prepared during any technical interview or exam. It is critical that you are prepared to answer these technical questions. Over 20,000+ copies sold! - Get the inside track on what questions the recruiters and experts will ask you. - Learn how to negotiate with recruiters to get the most money for your contract. - See what employers on LinkedIn, Twitter and Facebook want you to know when you interview. - Hundreds of questions and answers to test your programming IQ and get your prepared for any test or interview. 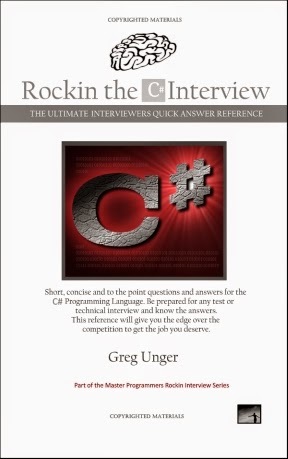 - The best compilation of the MOST asked questions in C# technical interviews. - Short, easy to remember answers that will allow you to memorize exactly what you need to know. - The ultimate cheatsheet to reduce anxiety, fear and nervousness in any interview! - Learn the DO's and Dont's from the industry experts. This book tells you exactly how the interview will work. - Bonus materials: MVC, ASP.Net, ADO.Net, Entity Framework, WCF, Silverlight and object oriented programming questions and answers! Be Smarter... Respond Faster... Know the Answer!